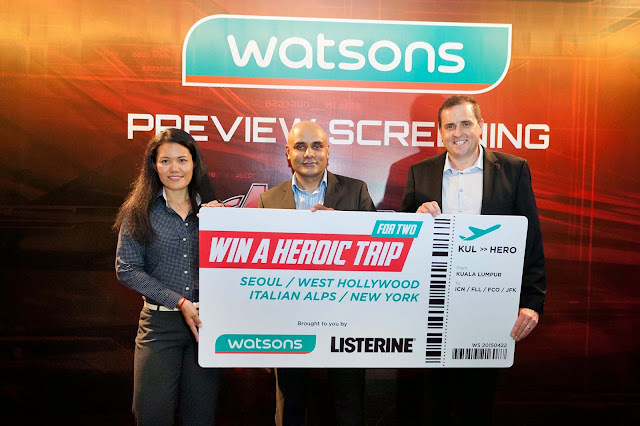 Win Yourself HEROIC TRIP through Watsons Heroic Contest! Today am going to share with you guys how to stand a chance to win yourself a HEROIC TRIP for yourself! Thanks to Watsons, yours truly was lucky enough to be able to watch the special premiere screening of Marvel's Avengers: Age of Ultron before everyone else get to watch it! If you ask me, I would say the movie overall was not bad, quite entertaining, but not as good as the first one. 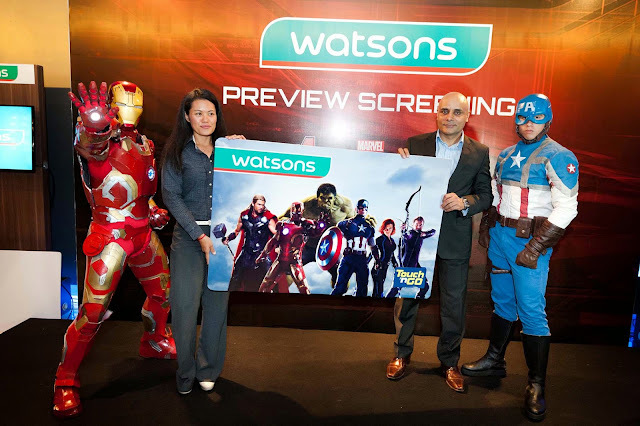 Apart of the premiere screening, Watsons also announced its latest endeavour, The Watsons Heroic campaign, which hit all Watsons stores nationwide starting 23 April 2015 until 20 May 2015, promised all its customers and loyal Watsons VIP Card members many fantastic offers and money-can't buy experiences. By saying that, shoppers get to meet the Marvel's Avengers characters in selected Watsons' stores nationwide and also take pictures with the 3D art floor stickers and #watsonsheroic to win great merchandise. Watsons has also launched the Limited Edition Watsons VIP Card with Marvel's Avengers stickers that fans can personalise! This limited edition Watsons VIP Card could be puchased at Watsons' stores or online store at only RM20 for new sign up and upgrade. On top of that, Watsons is giving away 4 pairs of HEROIC TRIPS which was featured in the blockbuster movie to Seoul, West Hollywood, Italian Alps and New York City when customers sign up or upgrade to the limited edition Watsons VIP Cards, or when they shop RM80 at Watsons inclusive of 1 Listerine item. This contest is organised in partnership with Johnson and Johnson. In case you're wondering about the selected locations, these are superb locations where the movie was shot, and the winners can even attend the world-famous Comic Con in New York, which tickets have been sold out months ago! “Watsons is always known to be in the forefront of innovation campaigns, and have always been organising tons of money can’t buy experiences for our Watsons VIP members. Do look out for more excitements from us soon,” said Danny Hoh, Head of Marketing, Watsons Malaysia at the event. Stuart Crabb, Country Director, Retail Group of Johnson & Johnson, joined them on stage and presented the mock flight ticket for the Heroic Trips to Kulvinder and Noor Farilla. For more information about Watsons Malaysia visit www.facebook.com/watsonsmalaysia or Watsons official website watsons.com.my and campaign microsite at www.watsonsheroic.com.